Provided you are not scared or at the very least intimidated by the thought of climbing a ladder to sleep, loft beds are some of the best ways in making the most out of small spaces. There’s just one thing that’s incredibly hard with such beds; if you are not up for building one yourself, being able to find one that isn’t just meant for kids and are tall enough for adults can be quite a challenge. Fear not as we did all the work so you won’t have to! We’ve dug up the 5 best IKEA loft beds that aren’t just attractive, but affordable as well! What are you waiting for? The most common issue of owners of loft bed frames is they can' be accessed quickly as the ladders have wrong settings. Thankfully, you won't have to deal with a wrong ladder configuration as the TUFFING Loft Bed comes with one that's placed at the center of the bed not just for ease of use but for the safety of the user as well. Additionally, there are straight rails for added stability. The upper bunk or the loft bed can accommodate up to 220 lbs, making the bed frame a tank! Guardrails are added to ensure that it would be impossible for you to fall off your bed even if you use a 5 1/8-inch thick mattress. Under the bed is some space that's free for you to use in whatever way you want. You can use it as a parking space for your bike or maybe your lounge or study area. If your room has limited space and you want a bed that will allow you to make smart use of every square footage, then the TUFFING Loft Bed Frame is a must-have and a worthy investment. The second loft bed on our list is the SVÄRTA Loft Bed Frame which is one of the rare pieces that offer both form and function. Its beautiful silhouette and sleek, streamlined profile make it extremely desirable regardless of the room's style or decor as it'll seamlessly fit into it. As for the bed's functionality, it doesn't just come with a sleeping area that can take a twin or single size mattress; it offers a sturdy desktop for working on tasks, too! If you are a 20-something living in a studio apartment, this IKEA loft bed will suit your needs perfectly. As your study/working area is provided by the bed already and its steel construction is solid and sturdy, there's nothing more you can ask from a piece of bedroom furniture. We even tried propping our legs on top of the desktop and it doesn't bow at all! 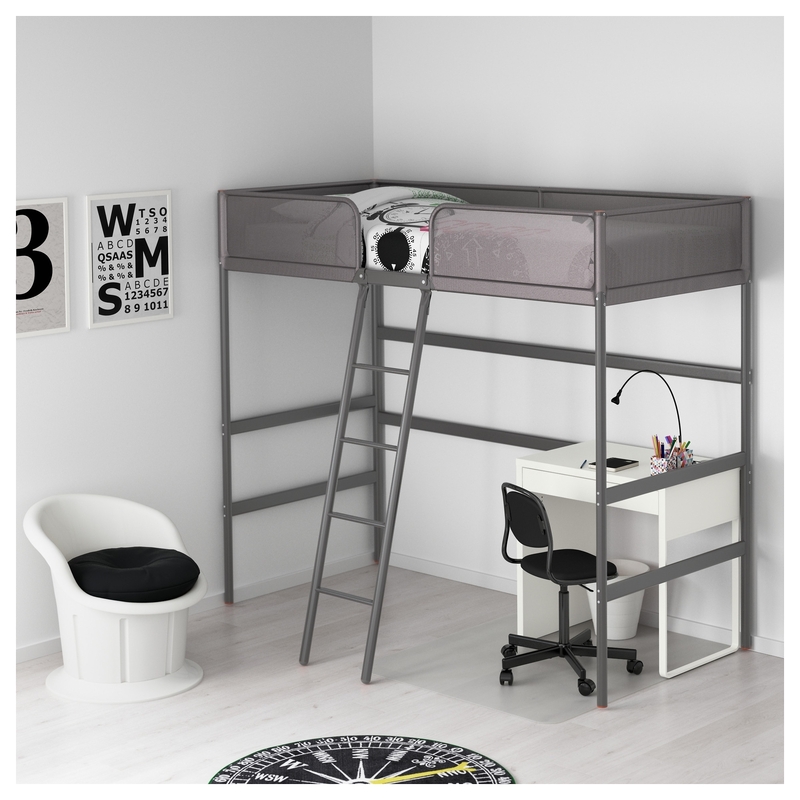 If your room has a high ceiling but there's limited floor space, then the STORÅ Loft bed frame is an excellent option as it will allow you to make the most use of what you got. Made of solid, sustainably sourced pine wood, the bed is finished in a beautiful black shade. The industrial style frame added with a side ladder is meant for the standard double or full-size mattress. Under the spacious loft bed is space that can be used in various ways. You can create a cozy reading nook or add a desk and a chair for your workstation. Regardless of what you choose, it's undeniable how it is truly amazing that a piece of furniture can be so versatile and functional at the same time. When fully assembled, the unit's dimensions are 79 7/8 " x 58 1/4 " x 84 1/4 ". Make sure you have a ceiling height of at least 8' 10" to fit the bed. The STUVA Loft bed combo is a well-engineered system that nests every single thing you or a kid needs into one stunning design, including a standard twin size bed frame, a beautifully finished writing desk, and open shelving for storage. If you are getting a bed for a kid, then this is one of your best loft bed options as it's low to the ground with its minimum ceiling height requirement which is 94½". It doesn't just avoid serious injuries; it's also a bed that isn't overly childish. It will fit kids that are starting to have their own interests. With the bed's clean white finish, it will seem like a blank canvass to a child! When it comes to its assembly, it's quite a massive piece with many parts involved but putting everything together was painless for us. The ladder is great as well as it doesn't stick out. It's most definitely a money- and space-saver in one! The bed is meant for a twin size mattress that's up to 8 1/4" thick. That's good news as you can opt for memory foam with this one! Bring work, sleep, and storage to new heights! Everything a child's bedroom needs is packed into this IKEA loft bed. As you can see, the STUVA/FRITIDS comes with a frame for a twin mattress, a wardrobe for clothes and bed linen storage, open shelving for the display of knick-knacks and books, and a working station for homework and various tasks! Add all that with the loft bed's sturdy design and it's a piece that's impeccable and undoubtedly worth your consideration. With the bed's cool white color, it'll also make for an excellent centerpiece for a room. As it's a well-made product, you can expect its assembly to be a walk in the park. When fully assembled, the entire piece measures 77 1/2 " x 41 1/2 " x 71 5/8 " with a maximum loading capacity of 220 lbs.